A picture of the earth that shows its spherical shape and shows the day and night, God be He exalted says: (He has created the heavens and the earth with truth. He makes the night to go in the day and makes the day to go in the night. And He has subjected the sun and the moon, each running (on a fixed course) for an appointed term. Verily, He is the All-Mighty, the Oft-Forgiving) [Surat Al-Zumar, verse: 5].And today we aren't suspicious of the spherical shape of the earth as we see it in front of us in the real pictures. God be He exalted says: (He has created the heavens and the earth with truth. He makes the night to go in the day and makes the day to go in the night. And He has subjected the sun and the moon, each running (on a fixed course) for an appointed term. Verily, He is the All-Mighty, the Oft-Forgiving) [Surat Al-Zumar, verse: 5]. God be He blessed and exalted talks about His countless graces, so He tells us about the creation of the heavens and the earth, He also makes the night goes in the day and the day goes in the night (their succession). He also subjected the sun and the moon, each running to a certain day. And here we can deduce an important scientific sign that the shape of the succession of the day and night is a spherical shape as they interfere with each other. The spherical shape of the earth has become one of the definite facts and this is shown in the pictures that have been taken to the earth from the outer space. 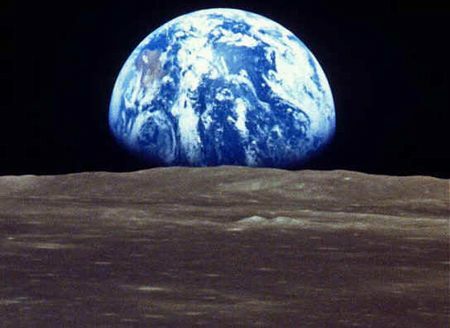 In 1968, the spaceship Apollo has taken the first picture to the earth and after that thousands of pictures have been taken to the earth; all of them have shown the earth like a ball that floats in the darkness. From this holy verse and especially in His Almighty saying: "He makes the night to go in the day and makes the day to go in the night" we can notice that the day and night moves in a spherical system and interfere with each other and this doesn't occur unless the earth is like a sphere and this is what has been actually found by scientists. The question here: If Mohammad peace be upon him wasn't a messenger from Almighty God, then from where has this expression come "He makes the night to go in the day and makes the day to go in the night" and how did he know that the earth is like a sphere? This is from the signs of the prophecy of Mohammad peace be upon him.